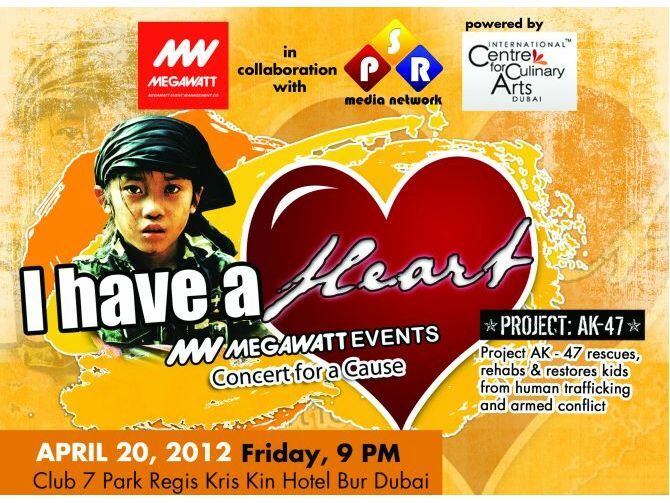 Megawatt Events presents I Have a Heart, a concert for a cause to benefit Project: AK-47, which rescues, rehabs and restores into the community the kids forced into human trafficking and armed conflict, mostly in the Philippines and Burma. The live show’s line up will feature Filipino well-known stand-up comedian Kim Idol and celebrity dancer and singer Geneva Cruz. The sale of the tickets will benefit the rescued children in the UAE and help Project: AK-47 take action. Admission: Tickets are AED75 each (incl 1 raffle ticket) and can be purchased in person at Eppco and Enoc petrol stations or online. I Have A Heart campaign gives you the opportunity to be a voice for these kids in the UAE and to help Project: AK-47 take action. Let one evening of your life be meaningful. With AED75, they guarantee great entertainment. And besides its just a perfect time to show that you have a heart. For more info visit pinoysoundradio.com/ihaveaheart, email md@pinoysoundradio.com or call +971 4 328 9205. Project: AK-47 cares and they believe you do too. Most children in armed conflict or trafficking situations want out. 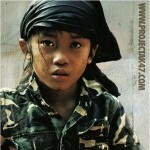 Project: AK-47 gives you the opportunity to be a voice on behalf of these kids and to help them take action. There is very little being done for child soldiers in countries like the Philippines and Burma, but we are at “ground-zero” fighting for kids to have a childhood and become productive members of their societies. A Tribute to Glee and Other Gleeful Tunes!